drive N on 270, through Frederick (270 joins up with/becomes Rt. 15 N). just after passing Frederick, turn onto Rt. 26, (it only goes east, exit on right) Follow for about 2 miles. Immediately after crossing bridge, bear left onto 194 (only goes north). Woodsboro is about 6 miles up. Turn left off 194 into town of Woodsboro. It's a very small town. Forestheart Studio is on SOUTH Main Street at the bottom of the hill where the water tower is; dusty red siding, purple-grey roof, white van in the lot. come N on Rt. 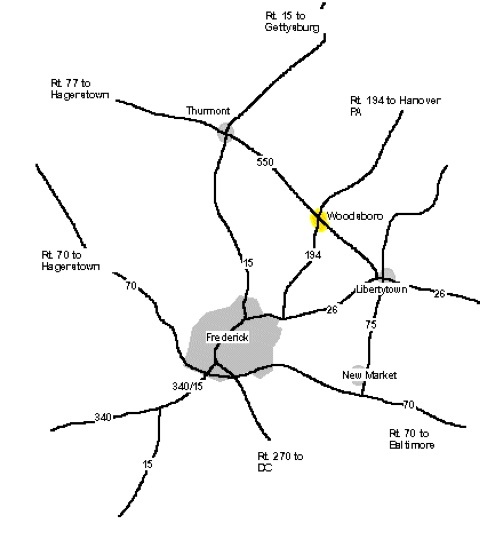 15, continue as above "From Rt 15 northbound"
Come to Frederick on Rts 70 or 340 or whatever makes sense. Proceed N on Rt. 15, continue as above "From Rt 15 northbound"
OR from Hagerstown, come over the mountains on 77 into Thurmont, and to Woodsboro on Rt. 550 as below. Come south on Rt. 15 into Thurmont, take Rt.550 (follow the zigs and zags) into Woodsboro. You will come into town heading south on Main Street; studio is on the left at the bottom of the hill where the water tower is; dusty red siding, purple-grey roof. Come west on Rt. 70 to New Market; turn N onto Rt. 75. At Libertytown, turn left on Rt. 26 for a very short way, then right on 550. Follow 550 into Woodsboro; you will come to a T at Main Street; studio is on the left. Take Rt. 30 (ugh) west to 194. Come south on Rt. 194 to Woodsboro.